WASHINGTON (CNN) -- Former Enron Corp. CEO Jeffrey Skilling will be given a hearing before the U.S. Supreme Court in his effort to overturn his 2006 convictions on securities fraud and other charges. 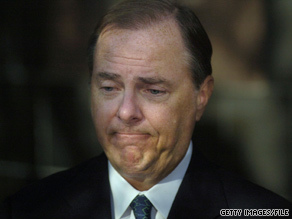 Former Enron Corp. CEO Jeffrey Skilling, here in 2006, was sentenced to more than 24 years in prison. The justices accepted his appeal and will hold oral arguments early next year over the culpability of Skilling's corporate duties. Skilling's attorney, Daniel Petrocelli, said that "pervasive media coverage" prevented his client from receiving a fair trial from a Houston, Texas, jury. Skilling, 55, is in federal prison after his conviction on 19 counts of fraud, conspiracy and insider trading relating to the collapse of the Texas-based energy services giant in 2001. He had been a longtime executive at what became the world's largest wholesaler of gas and electricity, with $27 billion traded in a single quarter at Enron's height. Skilling became CEO in February 2001 but resigned under pressure six months later as the company began to collapse financially. Thousands of investors and company employees lost their savings and jobs in a case that became emblematic of corporate corruption cases during the past decade. Skilling and Enron's top executive, Kenneth Lay, were accused of spearheading a massive campaign to mislead investors and shareholders with an aggressive investment strategy aimed at suppressing the company's shaky financial footing. Both men were convicted in May 2006. Skilling was sentenced to more than 24 years in prison and fined $45 million. Lay died in July 2006 before sentencing. A federal appeals court upheld Skilling's conviction. Skilling's attorney said all 19 convictions should be overturned because his client was improperly convicted of withholding his "honest services" from Enron's shareholders, a violation of federal law dealing with fiduciary responsibilities. Petrocelli said the government never proved Skilling's conduct was designed to achieve "private gain," as the law required, as opposed to advancing the company's interests. He also said the "honest services" requirement is too vague. "The government did not contend, and the record did not suggest in any way, that Skilling intended to put his own interests ahead of Enron's," the appeal said. And Petrocelli said, "The widespread, persistent and scathing demonization of Skilling by the Houston media far exceeded the editorial commentary" allowed by the high court in similar cases. Questionnaires submitted by potential jurors "confirmed the breadth and intensity of the hostility toward Skilling." The Justice Department had no immediate reaction. The department had told the court Skilling's claims were all without merit and urged the justices to let the conviction and sentence stand. In May, Petrocelli, a Los Angeles, California-based trial attorney, told CNN when the appeal was filed that questions raised by this case had current relevance, given the ongoing financial meltdown. "The issues presented in this appeal cry out for resolution by the Supreme Court," he said.